According to Rasmussen Reports’ daily tracking poll, President Trump has seen his approval jump 9% in just the last ten days. Having already started celebrating his 50% rating from just a few days before, “The Donald” is sure to be pleased upon learning that it’s actually higher at 52%. That means President Trump is enjoying his best numbers since shortly after his inauguration in 2017. This includes 39% who “strongly approve” of the President’s job performance, 47% who disapprove and 39% who “strongly disapprove”. Trump is polling better than his predecessor at the same time in his presidency, President Obama was polling right at 50%. 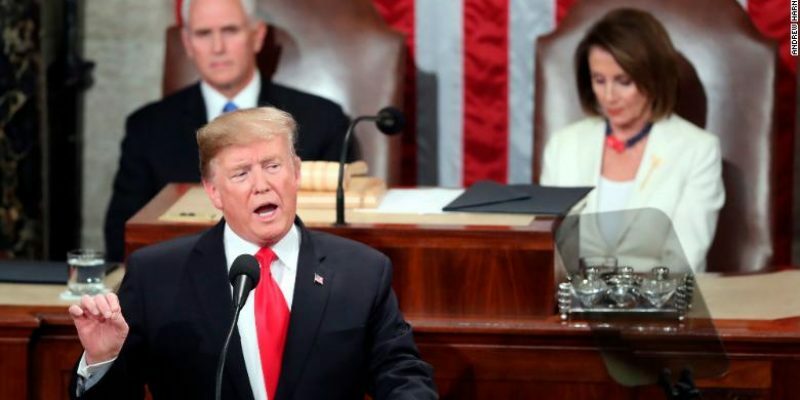 One reason for the positive results is the State of the Union address which was watched by nearly 50 million people and received overwhelming support across the political spectrum. CBS conducted a poll that concluded that an impressive 76% of viewers approved of the speech. The development comes just a week or two after the left-wing media did a victory lap, so to speak, over Trump’s pre-SOTU approval rating in the high 30 percentile. Another reason for the increase in support could be that the President’s hard-line on border security is going over well along with Trump’s plans to bring most of our troops home from The Middle East. To those who voted for him, his strong stance on the border wall is Trump keeping his word while bringing the troops home is honoring the lives of those we’ve lost. The news is sure to discourage the vast field of 2020 Democratic candidates which now stands at more than a dozen. “Now that Gallup has quit the field, Rasmussen Reports is the only nationally recognized public opinion firm that still tracks President Trump’s job approval ratings on a daily basis.